At Le Voov!, we appreciate businesses that access and support their local community for their inventory. We applaud Dean & Deluca for their unparalleled fresh, quality of products from farms, ranches, dairies, bakeries, wineries, and bee-keepers both locally as well as internationally. I was introduced to Dean & Deluca over 25-years ago while visiting the Manhattan area. As I recall, it was like stepping into an epicurean paradise of amazingly fresh, high quality, healthy food, all displayed with absolute perfection. This store is a ‘must’ for fellow foodies visiting the Napa area. The layout is open, spacious and airy with racks filled with everything from cooking utensils to oils/vinegars, handmade pastas, chocolate bars, honey, jams, nuts and a deli that cannot be beat. The meat and cheese sections are alluring in their own sense and I gravitate towards them every time, even if it is just to get a petite piece of cheese that must be eaten in the car on the way home. We picked up some Chili Crunch after being provided a taste of this marvelous condiment atop a piece of rustic French bread. It has a brilliant, crunchy blend of chilies and roasted garlic with a subtle heat that engulfs the mouth just after you swallow. Yummm! 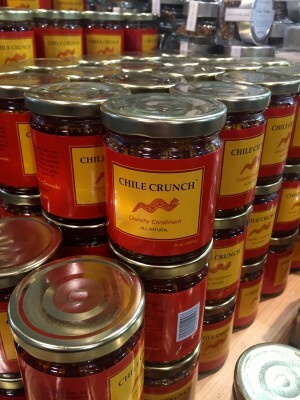 If you are interested in experiencing Chili Crunch for yourself, you can find it at our Amazon Store. I wish we had the pleasure of a Dean and Deluca store in the San Francisco Bay Area, but until we do, it makes our trips to Napa that much more enjoyable! Other U.S. locations include: New York City, Washington D.C., Kansas, and North Carolina. To read the full story of our visit to the Napa Valley wine country, please click here.